Wide range of foilage colors and textures. Undemanding and long-lived. Division not necessary but can be used as a means of increase. Hosta are one of America's favorite perennials due to their longevity, ease of care, lack of disease problems, and tolerance for shady locations. There are literally hundreds of varieties. Those that I carry are fairly common � but also quite undemanding and vigorous growers. Hostas prefer a moist, rich soil but not one that is waterlogged. Some will tolerate a leaner soil but none will do well in droughty conditions. Filtered sun encourages the best leaf color. The green-leafed types are the most shade tolerant. Hostas emerge fairly late in the season. Flowering time and colors vary widely. 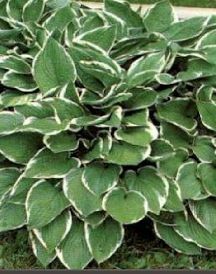 Division is unnecessary with Hostas but is an excellent means of increase and can be done in either early spring or fall. If division is not planned, new plants should be placed at least a foot apart to allow for growth.